The title of this post is a blatant homage to Nina Finci’s, as yet unpublished memoir Peel Me a Pomegranate about emigrating from Croatia to America age 15, shortly before the Yugoslav war changed her family life forever. Check out her blog(s). 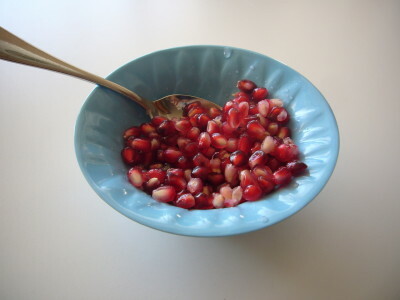 As for the pomegranate, in one section of her memoir, she writes a lovely story about how her mother peeled her and her brother pomegranates and sprinkled them with sugar for an afterschool snack. It’s true that we’d been eating pomegranates in my house long before I read Nina’s story, but there was something about the description of her mother, steadfastly peeling the tough fruit, her hands stained red, and setting out the bowls of ruby seeds for them that was utterly moving, and made me think I had never really had a pomegranate–not like she had. Nina’s story is about eating something delicious and rare and beautiful and oddly satisfying, of course, but it’s also about bringing the family together, and a home she lost, and a mother who nurtured her children in many ways. The pomegranate is a prism into the rich, complicated family life, what is lost and gained over a lifetime. So now, everytime we eat pomegranates, I think of Nina & her story and how she is probably peeling pomegranates now for her own daughter, and it makes me feel connected to the world. Finn, on the other hand, just thinks they’re fun and addictive to eat. 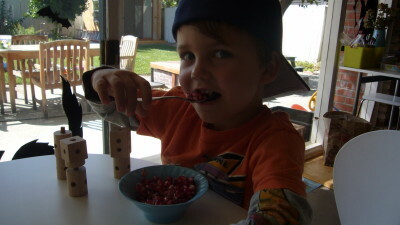 And since I’m not above playing with your food as a morning activity, occasionally, we like to peel a whole bunch of pomegranates all at once and keep a jar of the seeds in the refrigerator for a quick snack or garnish for salads, kidtinis, or cocktails. On the one hand, it’s not a bad small motor skill activity. 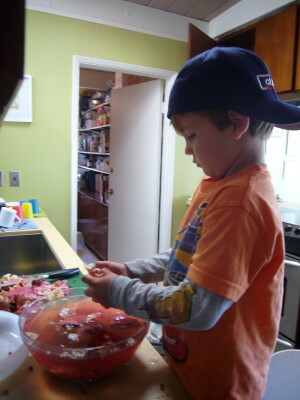 But he’s also helping in the kitchen, learning where the fruit comes from and how it’s eaten, and he gets to see different colors and sample the different flavors of the different varieties. We peel the fruit in a bowl of water. The edible seeds sink and the membrane and rind float, so you can just scoop them off and discard or compost. 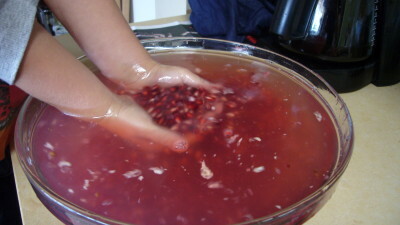 Sifting pomegranate seeds. Just because. The activity degenerates as Finn tries to figure out how many seeds he can fit in his mouth. 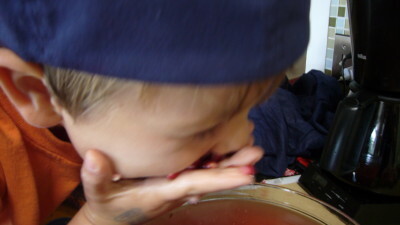 Finn eats a pomegranate like a human being. 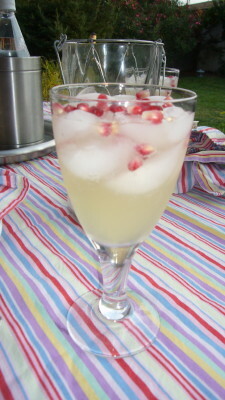 Fill a goblet or similar glass with ice and a tablespoon of pomegranate seeds. Top with bubbly water and a splash of Roses Lime Juice, to taste. The bubbly makes the seeds float, and the kids can carefully scoop them out with a spoon. 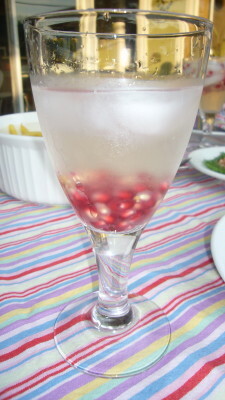 Muddle the pomegranate seeds, then combine with sake and vodka in a cocktail shaker with the chipped ice and shake well. Strain into a martini glass and garnish with more pomegrante seeds. **In the picture above, we just added the seeds as a garnish to the regular saketine, but they sank. (No bubbly water….) Later on, I crushed the seeds in my glass to release the juice, which was delicious, thus the suggestion to muddle the seeds first.